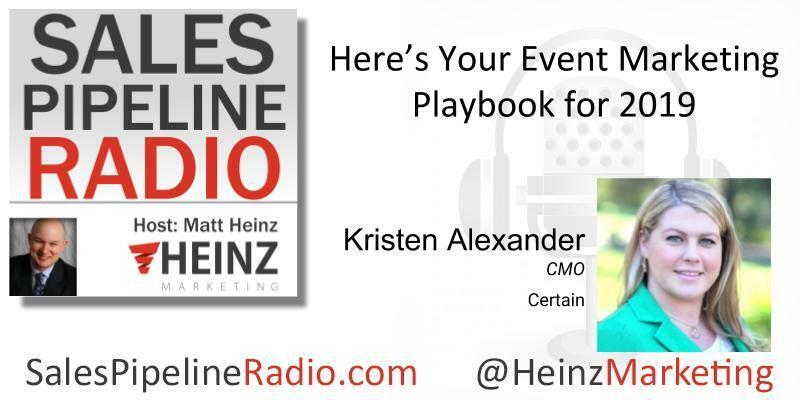 In this episode, "Here’s Your Event Marketing Playbook for 2019" we talk to Kristen Alexander, CMO at Certain. Recently we worked together on an Event Marketing Playbook. We'll talk about that. We're going to get tactical, we will talk strategy. It's real, practical advice to drive real results in organizations that are doing events. I think a lot of people when they do events just do the same old stuff. You get a sponsorship, you get your booth, you go through the motions, and then you're wondering where the revenue is and why you spent all that money. Kristen will talk about some of the pitfalls she sees from event marketers that aren't getting the kind of ROI they need from events today. We'll also double down a little bit on the discussion of data strategy for events because I don't think a lot of event marketers and event managers are thinking about what their data strategy is. We'll also talk about some examples of why managing data, using the right data is so important to getting results out of an event. I want to give a huge shout out to today’s sponsor, MailTag.io. It’s a super helpful tool if you’re in sales because you can receive real-time alerts, right on your desktop, as soon as your prospects open your emails or click links within your emails.